We were hoping this story would be a continuation of the first book. Perhaps switching over to tell us the Buffalo Boy’s tale? So which book did we like better? My 9 year old, E, still loves “Where the Mountain Meets the Moon” best. He says it’s because there are dragons in the first story but none in the second. 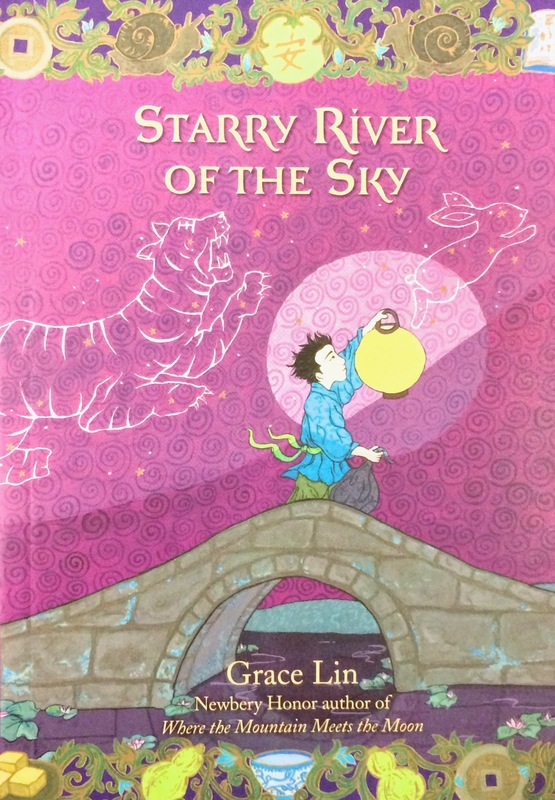 My 11 1/2 year old, Si, prefers “Starry River of the Sky.” He pointed out that the main character in the first story, Min Lee, was just a nice kid from a poor family. Nothing much actually changes in her. But the main character in this second story, Rendi, has to deal with a lot more conflict which makes more interesting. I have to side with E – the second book was good, but that first one was superb. I loved the simplicity of the sweetness of it. Min Lee is just a nice kid, but she does grow and learn in throughout the book – just not in the more internally conflicted and angry way of Rendi. But hey, in the end it’s kinda like asking what is better, dark chocolate or milk chocolate? Why not just enjoy both kinds? And while you’re at it, read both of these lovely books by Grace Lin. I’ve had enough Halloween crafting for this year. Got an early start at the end of August with my Halloween Make list and have been chugging away ever since. Sewed my Halloween garland up first. Never got around to posting the end result, but it decorated my studio for a good six weeks and is now hanging in my apartment close to three bags worth of plastic spiders climbing all over the walls. If anyone looking for a tutorial on how to sew a triangle garland, I like this one. Came up with a pattern & crocheted that amigurumi black cat. Super pleased with the results. This guy came home with me too. I like him so much, I may strap him to a broom & take him out trick-or-treating with me to soup up my witch costume. Sewed two pumpkins. Thought one looked uninspired and the other looked like a big radish. Trashed the idea of sewing a pumpkin patch. Took my kids to an actual pumpkin patch & bought real pumpkins instead (much better). I thought the amigurumi cat was going to be my best craft of this Halloween season, but the guitar trick-or-treat “bag” turned out even better. Kid creativity paired with adult execution wins every time. And now, it’s time for my final Halloween craft of the season. 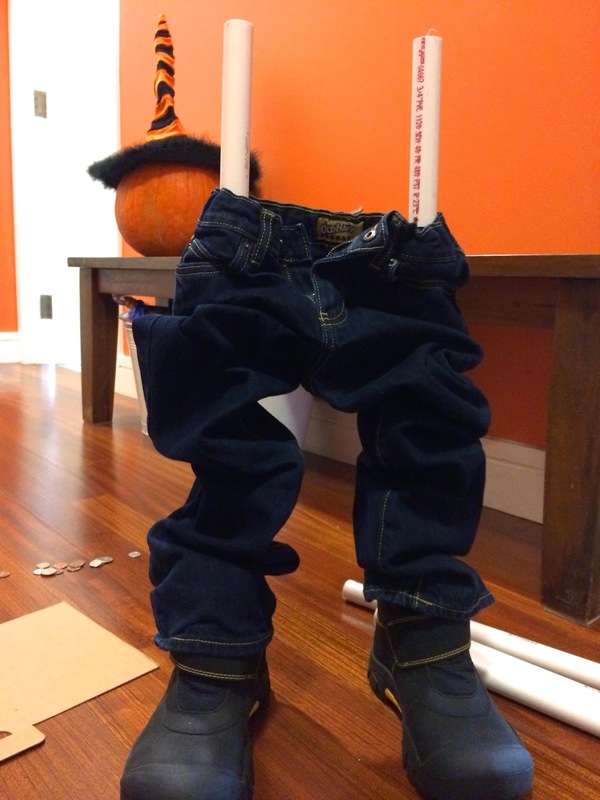 Constructing the “scarecrow.” This year, his name is Creep-E. I started constructing scary looking scarecrow type figures decades ago. As kids, my brother and I would stuff his clothes full of towels and scraps. Make heads out of a ski-mask covered footballs. And prop our creations on chairs in the basement. He eventually outgrew this childhood game. I didn’t. 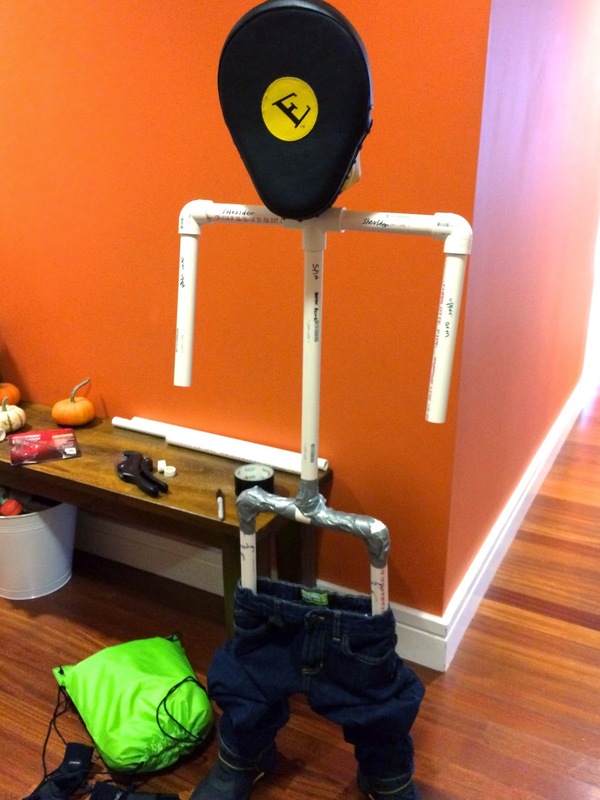 My best and scariest creation was cobbled together at my parents’ home when I was prepping for the GRE’s. That gnarled and bent over old woman with the freaky face made even my college aged brother jump when he found her sitting in our dad’s wheelchair in a darkened room gazing out into the night. Second runner up was my version of “Other Mother.” Wow, she was actually pretty scary too. The only problem was, her skeletal structure was created by tying dowels and wooden spoons together. Way too fragile. She was in constant danger of sliding out of position. This year, I decided the most important part to Creep-E had to be a stable skeleton. I intend to leave this guy out by our door to greet the kiddies trick-or-treating, so I need him to be able to stand tall for a few hours. I’d seen some images on the internet with skeletons constructed from PVC pipes. Decided that was exactly what Creep-E needed. Took a little field trip to Home Depot. 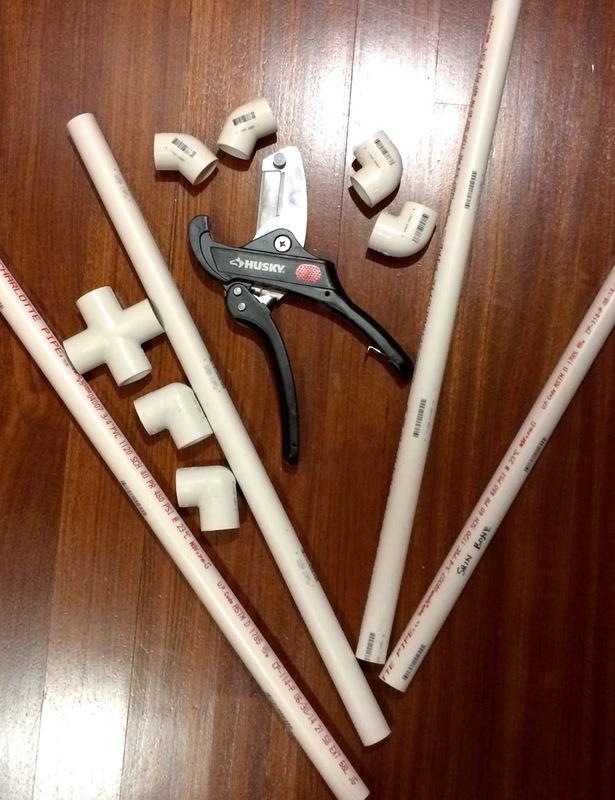 Bought some 3/4-inch PVC pipes and connectors and a Husky All Purpose Ratcheting Cutter (which may be the coolest cutting tool ever…). Then it was back home to dig out some boots and clothes for Creep-E.
There’s really not too much to the construction of these creepy guys I love to make. Most importantly, start at the bottom and work up. Remember that song – “the foot bone is connected to the ankle bone…” it’s like that. The leg stays in the boot better if you anchor it in a sock filled with rocks or coins and rubber band everything tight. Use duct tape on the joints. Think outside the box when figuring out what to use as body parts. I shoved a focus mitt onto Creep-E’s “neck” and then wound old boxing wraps around it to create a blank face. Too many details can be distracting. Creep-E is creepier without a face. Mostly play. Some experimenting. A little cursing. And suddenly, the figure is almost complete. Here, Creep-E is looking emaciated and stiff. Plus his chest is caved in. 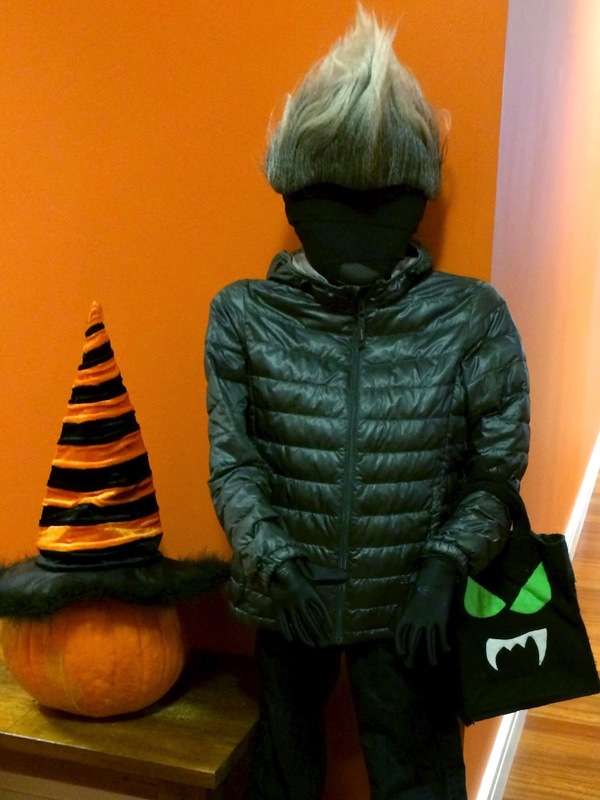 Added a puffy jacket, a weird wig from our costume box and gave him the first trick-or-treat bag I made my Simo years ago. And he’s ready for Halloween. We’d put him outside our apartment tonight, but we’re pretty sure he’ll scare our sweet little four-year-old neighbor girl. He’s leaning in the dark hallway right now. Silent. Waiting. Resting between my bedroom and my boys’ rooms. He’s already startled everyone in the family at least once tonight. Remember those Gumdrop Pincushions I needle felted last year? I’m still quite fond of them but have noticed a slight problem. Too much handling of the the Gumdrop Pincushions causes the felted roving to start fuzzing up again. Easily remedied with a little needle felting maintenance. But in my studio, where students share sewing supplies – including pincushions – needle felting maintenance once or twice a month is getting a little annoying. Time to look for a new pincushion solution. Or, rather, it’s time to look at an old solution…. Enter the standard red tomato pincushion. Available at just about any store that sells sewing supplies. It’s functional, economical and generally long lasting. But I also think it’s kinda cheap looking and lacking in character (is it too nit-picky to want character out of a pin cushion?). Step 1: Purchased and dissected a standard pincushions. Step 2: Found a tutorial on how to sew a tomato pincushion. Step 3: Tweaked a few steps from the tutorial. Most importantly – I only stitched. NO glue. 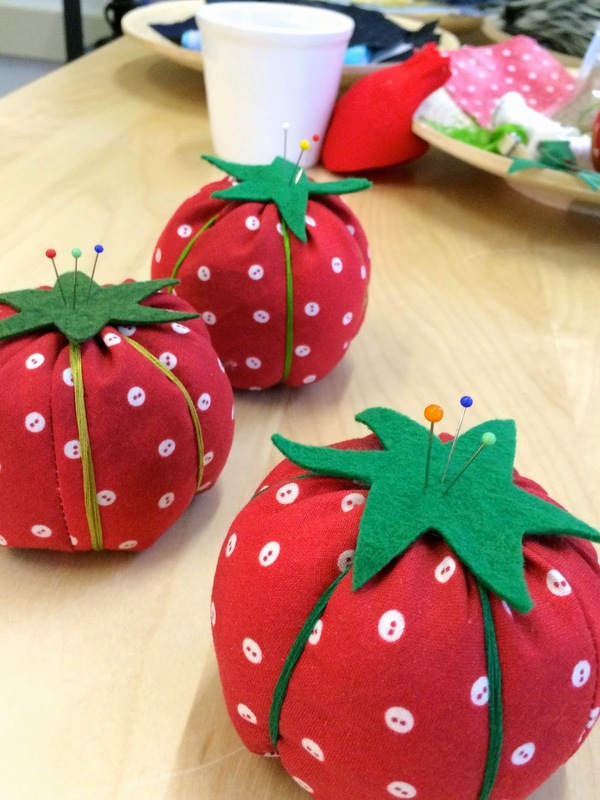 Step 5: Evaluated & made plans for next round of tomato pincushion making. I thought my purchased pincushion would be stuffed with poly pellets. Instead, I was dismayed to find it filled with something like sawdust (?) and maybe some flotsam and jetsam swept off the sweatshop floor all wrapped up in a flimsy plastic bag. I suppose the environmentalist in me should be happy it wasn’t filled with plastics… but in truth, I was a little yucked out. But in the name of experimenting, I transferred the nasty sawdust (bag and all) into one of my three pincushion bodies. I filled the second one with partially needle felted roving. I used a crushed walnut and lavender mix in the final pincushion. 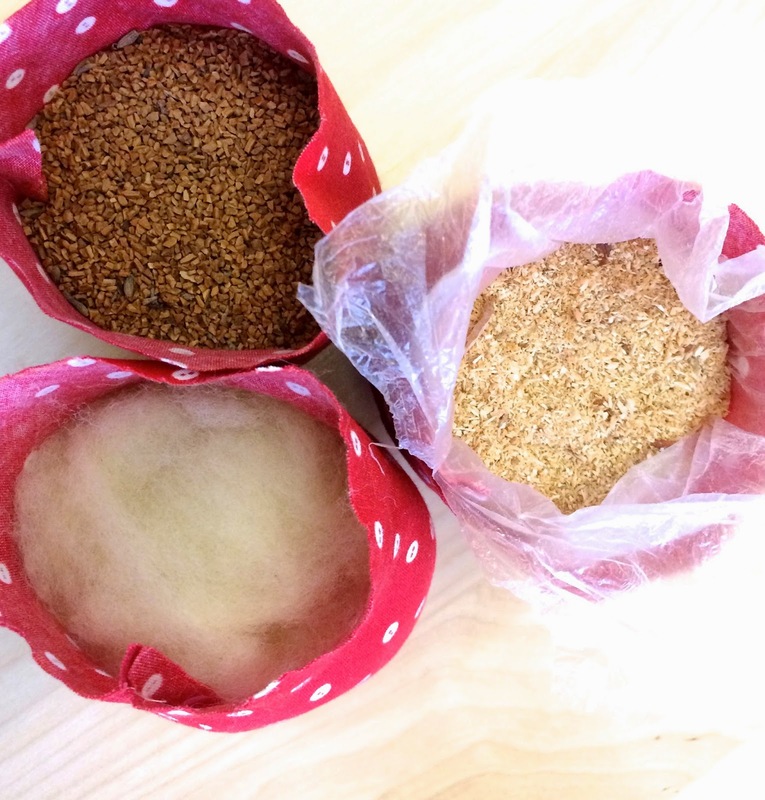 By the way, lots of tutorials suggest using fiberfill in pincushions. I don’t use this because I think fiberfill too light. No matter how tight it’s packed in, it doesn’t have the right resistance when the pins are pushed in. Closed all three up. Wrapped embroidery floss around each. Blanket stitched on felt tops and bottoms. They look about the same, right? But they feel completely different. I asked the three women who were in my studio today to test them with me. We picked each pin cushion up. Tested its weight. Gave it a squeeze. Poked pins in it. Even sniffed at it (can’t help it when there’s that lavender scent wafting about). All four of us favored the walnut/lavender stuffed pin cushion. It lends a really nice weight to the pincushion. Smells great. And feels right when pushing the pins. My only concern is that I do have children taking lessons in my studio. With nut allergies rampant these days, I don’t want to risk someone having a reaction to one of my pin cushions. 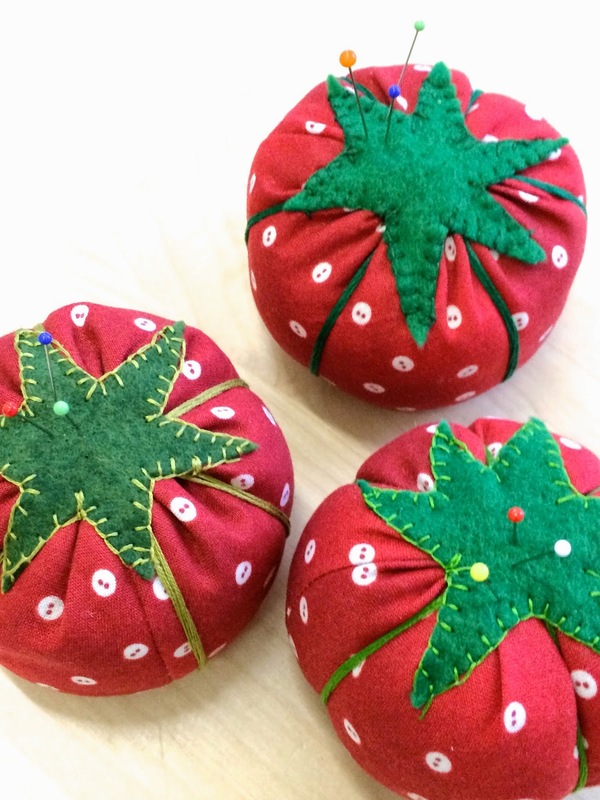 In my studio, I’m going to fill my tomato pincushions with the needle felted roving. It’s a little more labor intense to complete, but at least I won’t have to worry about kids and nut allergies. For myself and for gifts for friends? Most definitely the walnut and lavender filled pin cushion. Think I’m going to upgrade the fabric to linen. And if I really want to go all out, I think using 100% wool felt would be really really nice. As for that sawdust filled one… well, experiment is over. Think that one gets picked apart so the stuffing can be dumped and then refilled with some of the good stuff. My almost-9-year-old, E, thinks I can make anything. Have to admit, that’s pretty flattering. But sometimes my boy’s faith in me gets me into some pretty troublesome projects. Undeterred by my griping about my wasted efforts on the teepee, E recently requested a new project from me. 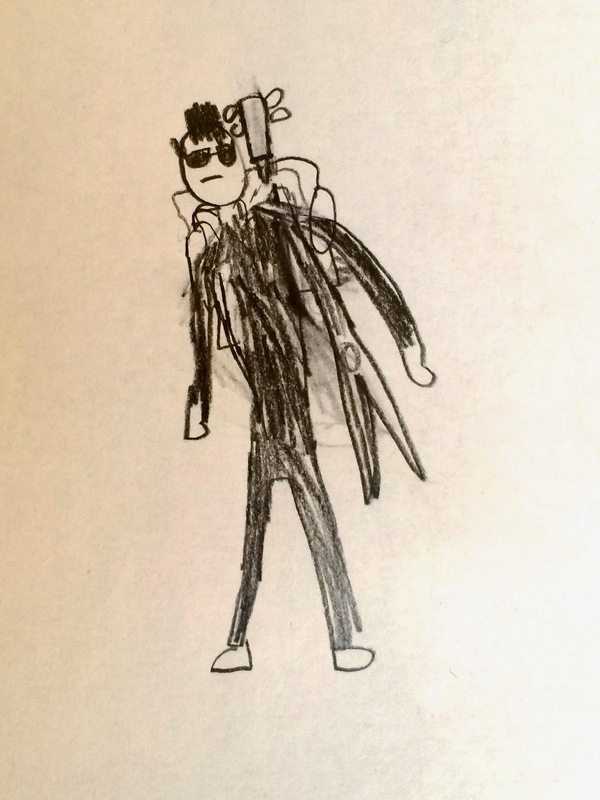 Here is E’s sketch of himself dressed as a rocker for Halloween. 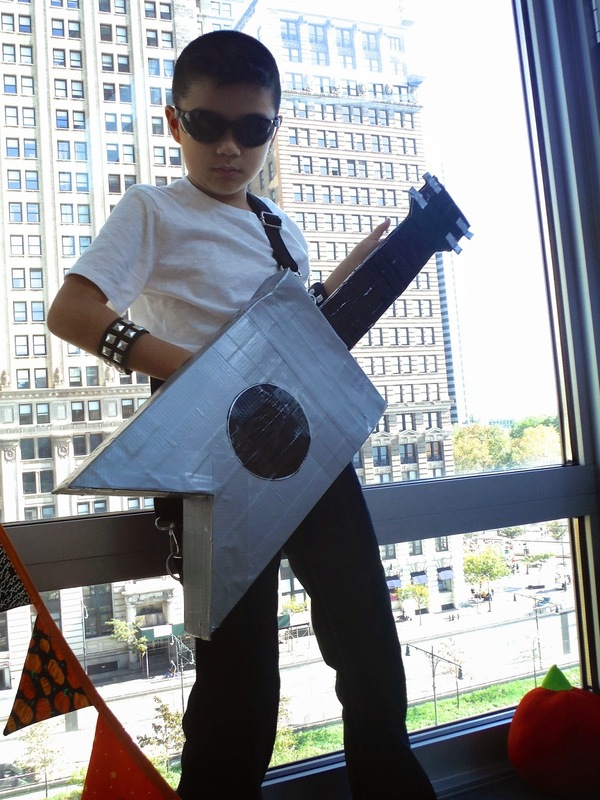 He needed a guitar. But not just any kind of guitar. 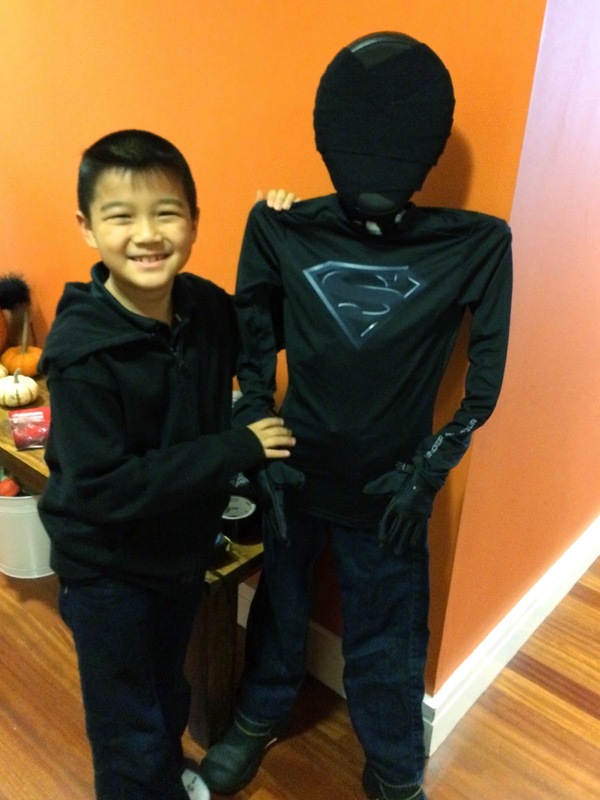 This one had to hold his candy as he went trick-or-treating. 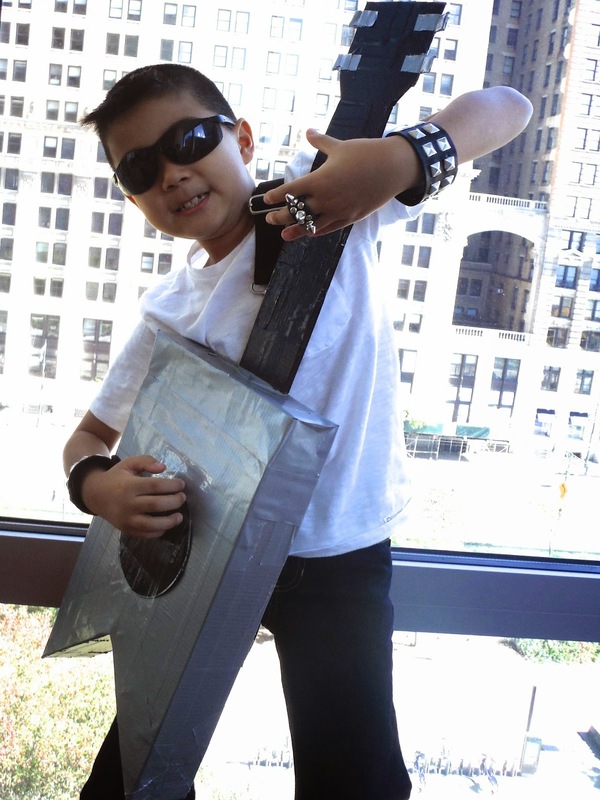 He wanted pointed ends on the guitar and a strap so he could carry it on his back to look extra cool. Ok boy-o. I’ll do it because I love you.. 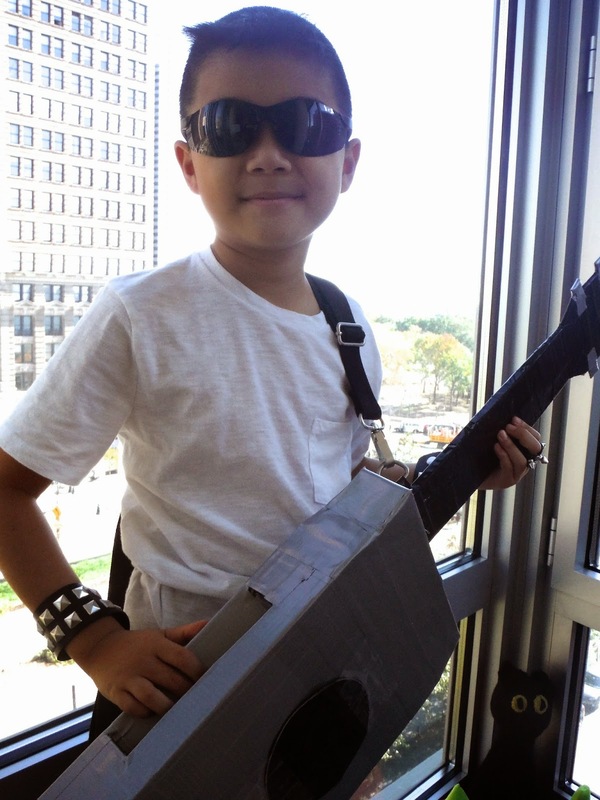 The idea of the trick-or-treat-guitar-candy-holder might seem like a simple project. But in fact, I found it pretty tricky. It had to be lightweight enough so E could carry it down the stairwells of the 5 buildings we’re planning to visit on Halloween (with about 30 floors per building). 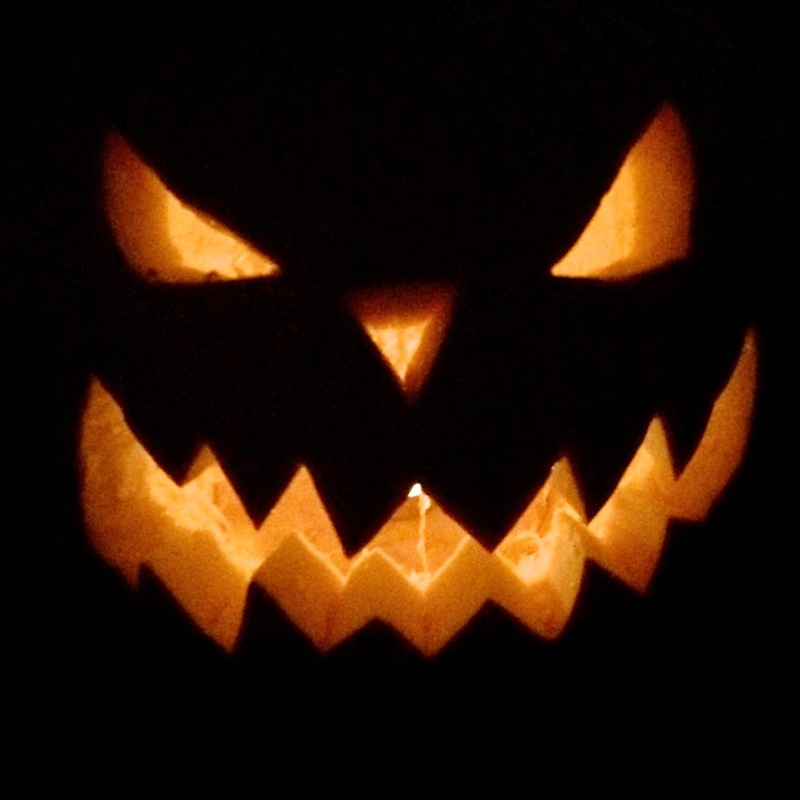 It had to be strong enough to survive accidental bumps against narrow stairwell walls and other kids out trick-or-treating. It had to be made with a material that wouldn’t scrape anyone else up in case E bumped into them. My first thought was how cool it would look if I could make the guitar with something like balsa wood, screws and fishing wire. I could paint in all sorts of details. Unfortunately, it would be way too fragile to be functional. Instead, I decided on using good ol’ cardboard and duct tape. 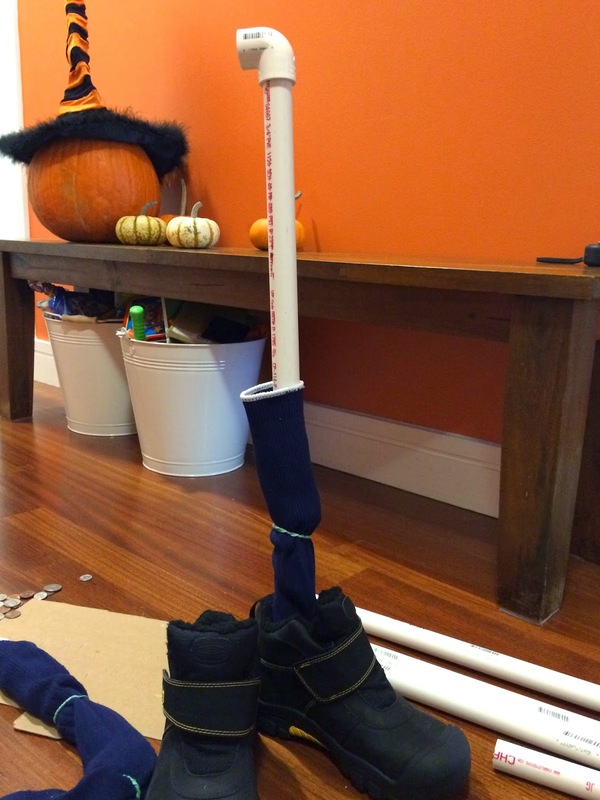 Clumsier to work with, but strong and flexible enough for our Halloween needs. Took out the duct tape, scavenged up some cardboard and poured myself a glass of wine. Time to craft. Took me a few crafting sessions to finish E’s guitar. It has the double points as he requested. An opening on the side where he can drop his candies in. 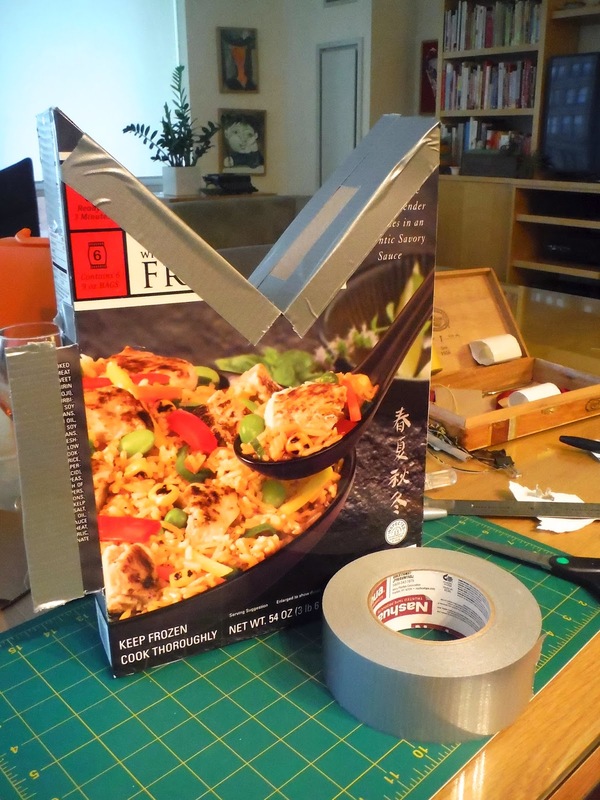 A metal reinforced cardboard neck with D-rings to attach the canvas strap to. And just a little bit of detailing using only duct tape. And there it is. 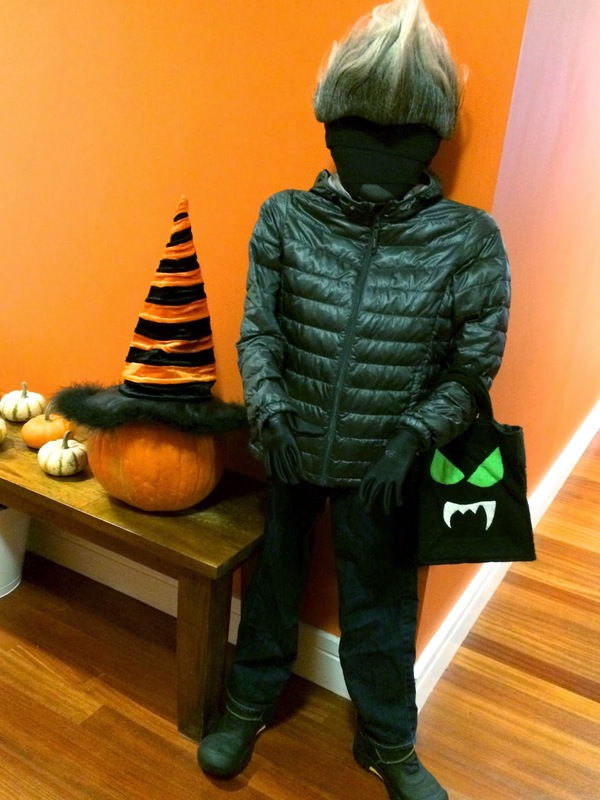 A guitar trick-or-treat “bag” for my E. Rock on kiddo!